With organic & natural ingredients Gentle blend for baby sensitive skin With moisturising aloe vera Dermatologically approved No animal testing Free from any nasties like SLS or parabens No artificial fragrances or colours Vegetarian Society approved Registered with the Vegan society Soothing chamomile shampoo & bodywash Dear Baby, we have worked with mother nature to make a selection of natural products just for you. Our lovingly crafted chamomile shampoo and bodywash will gently soothe you, leaving you feeling squeaky clean, silky soft and smelling yummy. 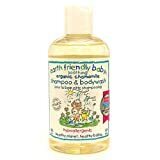 Find out more about our lovely products including bubble baths, lotions and wipes at www.earthfriendlybaby.co.uk Facebook/EarthFriendlyBabyUK Recyclable Registered with the Vegan society Vegetarian Society Approved – Prepare and Use: To Use: Squeeze a capful into your hand. Gently wash your baby’s wet skin and hair. Rinse then finish with a soft towel and a cuddle. Caution: Although safe and natural, if ingested please contact your family doctor. Avoid contact with eyes. If product gets into the eyes, immediately rinse with water followed by a hug. This entry was posted in Buy Supplements and tagged 250ml, Baby, Bodywash, Chamomile, EARTH, Friendly, Organic, Shampoo, Soothing by TOSMS. Bookmark the permalink.